I'm not sure when it happened exactly, but somewhere along the way I got fed up. I got bored of the cancer gig. The novelty wore off and I was left just feeling bald and lonely. And icky. And ever so BORED. So I become complacent. Without even realizing it, I stopped washing my hands a million times a day. I finished Nia's half eaten whatevers now and then. I thought about heating up some marrow broth and then opted for something else instead. I went to a couple of "things" involving groups of people. I had a few sweets (including a Aprium Sorbet from Penny Ice which I refuse to regret). I didn't out right fall off the cancer-fighting-wagon, but I was definitely flirting with the ground below, maybe even running beside the wagon with just my hands touching, chatting up passengers in other cars. Maybe once or twice I only had a fingertip touching. Look, I'm still holding on. No, really, I am being safe! Sure, fighting cancer sounds really hot and in-the-trenches and gettin' down to the nitty gritty. But in reality it is pretty tedious. It is a lot of frustration, mixed with some heaping spoonfuls of depression, peppered with kindess from friends and family here and there, and generously coated with a heavy icing of fatigue. Some days are about planning play dates so that naps can happen. Other days are about executing said naps. And that's. About. It. Wash, rince, repeat. So somewhere along the way I got tired of it. I wanted to be pre-cancer April. I wanted to do stuff with my kid and enjoy this blossoming summer. I wanted to eat whatever I wanted. I wanted to -- oh my god, the horrors! -- stay awake from 2:30 and 5:30 in the afternoon. Yes, I'm already cancer sick. No, this was run-of-the-mill sick. Although fighting a cold without an intact immune system is rough. It crept over me slowly on Sunday and by Monday I was feeling pretty bad. Lots of body aches, congestion, coughing. Then there were the tears that just came out of nowhere: Tears over who should pick up Nia from Farm Camp, tears about being tired, tears about my fingers hurting. Tears because there were tears and those first tears were pointless, useless, irritating. So last night, around 1a when I was fighting sleep, Joe intervened and gave me a pep talk. He lifted me back up on the wagon and fastened my safety belt. Told me to keep my hands and feet inside the ride at all times. And as I lay there coughing, I knew he was right. I'd been slacking and now I was paying for it. Today is my 12th infusion of Taxol. In other words: My LAST TAXOL! Twelve long weeks, but the fight continues. Next Wednesday I'll begin the new chemo cocktail: FEC-H. I need to be strong and ready for it, because by all accounts it'll be harder than the Taxol. So, I'm sipping my broth from the front seat of the wagon -- looking forward. Not back, not down. Forward. 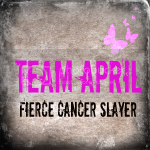 And I'm taking some strength and fighting spirit from Team April. If they can keep on supporting me with extraordinary feats of time, courage & generosity, surely I can keep up my end of the bargain and keep my body in fighting condition so the chemo can really do its job, right? Sheesh, use your grey matter, April. This photo came over the weekend from Joe's cousin Allie, who wrote: My Starbucks store volunteered at the Chico, Relay for Life. You were my cause this year! And my friends Laura and Christine were also cheering for you today! You are my inspiration to be an amazing human being, and mother. You are beautiful inside and out. And so in this war against the cancer, it's time to stop talking like a General and actually go be one (thanks, Buffy). Bring on Phase 2! Grrr. Rwarrr! Now, if you'll excuse me, I have to go soak my fingers and toes in frozen peas while I absorb my last bag of Taxol.